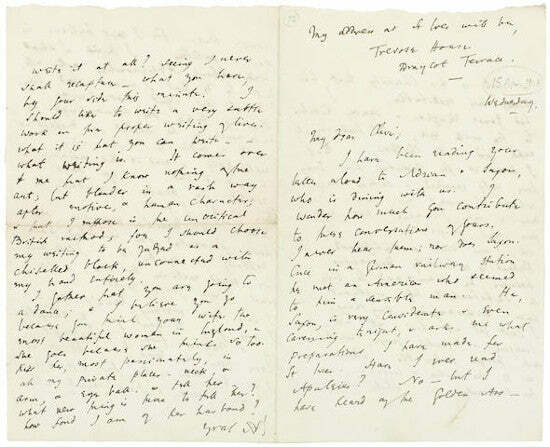 A letter written by Virginia Woolf to her brother-in-law in 1908 is valued at $10,000-15,000 ahead of a sale at Bonhams New York. It dates to early in her career - prior to the publication of her first novel, A Voyage Out, which was released in 1915. She talks about the development of her writing, explaining: "I should like to write a very subtle work on the proper writing of lives. What it is that you can write, & what writing is. "It comes over me that I know nothing of the art; but blunder in a rash way after motive, & human character... I should choose my writing to be judged as a chiselled block, unconnected with my hand entirely." A handwritten letter from George Washington is also offered. It dates to March 1, 1782, a year before the end of the revolutionary war, and is written in reply to a request by a Colonel Dayton to execute a deserter. Washington agrees, but does not give a date - meaning Dayton would have to submit a separate request. Washington was largely against the practice of executing deserters and avoided implicating himself where possible. We have a wide selection of autographs available in our online store.